he Gray Leaf Cotoneaster has origins from China and is a small to medium dense evergreen shrub that can reach up to 5 feet tall. 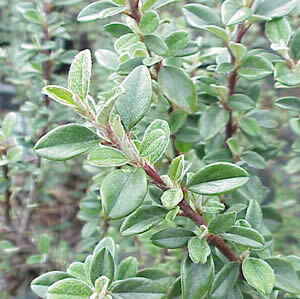 The leaves are small and have a distinct gray color from the gray pubescence. Cymes of white flowers appear in summer followed by orange-red to red colored berries that are retained throughout the winter. Cotoneaster glaucophyllus does best in full sun, though it can take some shade.